12V Power Runner, It is made of Lead Acid , capacity rated at 3.4 Ah. 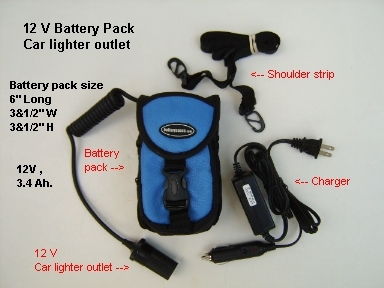 It comes with a 110-240V AC input worldwide support charger. Use Power Runner to power most portable devices which have a car lighter jack. Just connect Power Runner to your digital camera, video recorder, or any portable device , use Power Runner to charge the battery or run the device on the go. Input Power: AC 100 ~ 240V worldwide power acceptable. Charger Output-15V, 800 mAh. It will only need 5 hours to recharge your Power Runner. Output Power: DC 12V , Car lighter jack outlet.